Connecticut is celebrated for its long-lasting commitment to education. In fact, in the mid-17th century, Connecticut was considered the most literate place on earth, primarily due to the early Puritans’ insistence that every member of their society be able to read and write. Our schools continued to flourish in the 19th century under the leadership of Henry Barnard. The Wethersfield Academy was built in 1804 at a final cost of $3489.52 including land. This cost was paid partly by public funds and partly by donations. The academy opened later that year as a high school, teaching primarily higher mathematics and navigation. In the 1820s Rev. Joseph Emerson rented the building from the First School Society for use as a female seminary. As many as 100 female students from New England and the surrounding areas were boarded in local homes and took classes at the school. The academy operated in this manner for approximately 20 years. On New Year’s Eve of 1839 fire gutted the building. It was rebuilt a year later and opened once again as a high school, with a large upstairs hall that was used for various town and church functions such as meetings and dances. 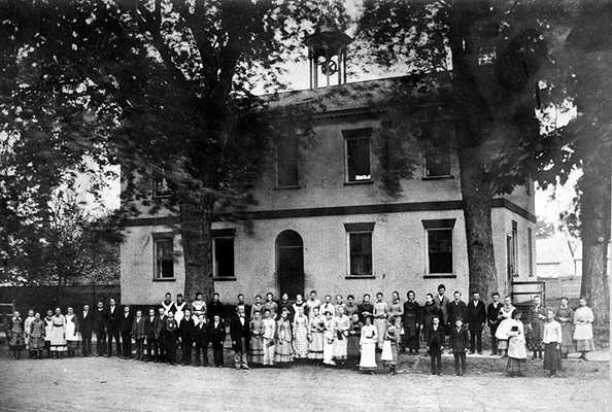 In 1894 the building ceased to be used as a school. A library occupied the lower level, and the first town library was established there in 1908. Eventually the town clerk and other local government offices were moved into the building as well, and it became the town hall. A new town hall was built in 1959 and the Academy building became home to the Wethersfield Historical Society.